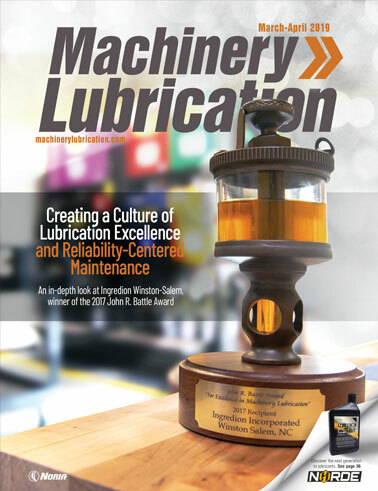 Centralized grease lubrication systems are widely used in industrial and heavy-duty mobile equipment applications to lubricate multiple points on a machine. These systems range from a simple single-port lubricator to complex dual-line, reversing units employing timers and alarms to deliver grease reliably to hundreds of grease points. The design parameters of centralized grease systems include the volume and frequency of grease required at each point, the number of points requiring grease, operating conditions, pump pressure, line diameter and distance to the grease points. When used and maintained properly, centralized grease systems can help enhance technician productivity and simplify equipment maintenance processes. The following is a comprehensive overview of centralized grease systems and the benefits they offer, the various types, concerns to watch out for and tips on how to maintain them properly. Centralized grease systems are designed principally to make the work environment safer for maintenance personnel by simplifying the process of accessing remote grease points, especially in confined spaces, when equipment is in operation. However, the primary benefit is derived from the continuous application of small amounts of grease resulting in improved equipment life, due to the uniform supply of grease. Hand application is typically performed infrequently and may result in uneven amounts of grease being applied, which can lead to overgreasing resulting in damaged seals and elevated bearing temperatures caused by grease churn. 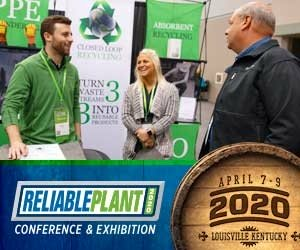 It is important for maintenance professionals to realize that many centralized grease systems have long lines, precise metering valves, fittings and numerous connections that can malfunction due to vibration, air entrainment and other environmental impacts. Thus, carefully monitoring and maintaining the systems on a consistent basis is critical. 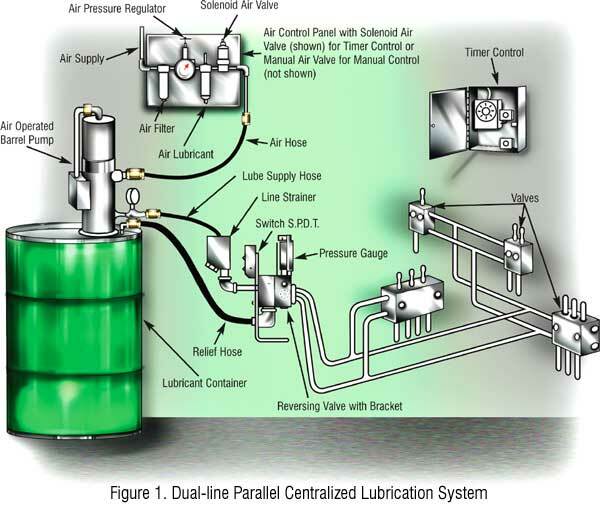 Centralized grease lubrication systems are designed to lubricate the broadest range of stationary and mobile equipment. 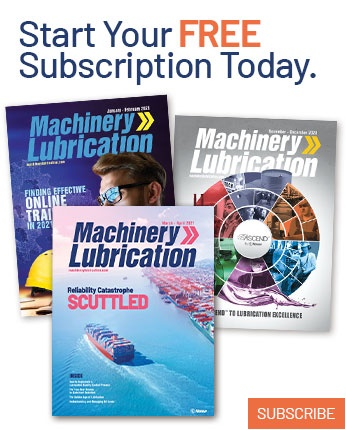 As the lubrication application becomes more complex, the design of the system also becomes more complex as additional features are added. 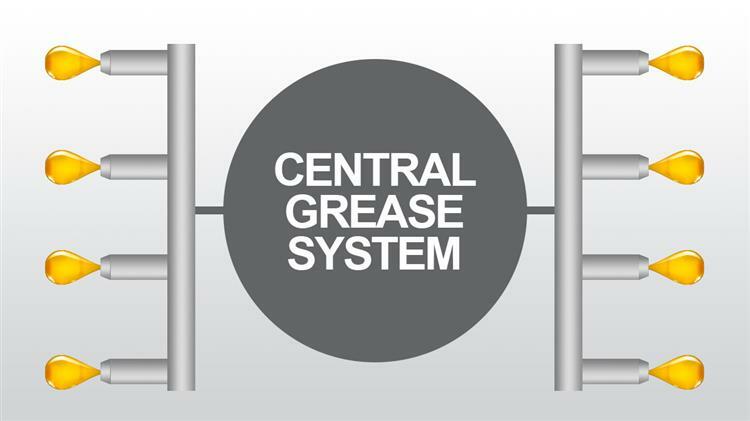 Most centralized grease systems fall into two categories. The first is a direct system in which a pump is used to pressurize the grease and meter it out to the application point. The second and more complex type is an indirect system in which a pump pressurizes the grease. Valves built into the distribution line are then utilized to meter the grease into the bearings. Indirect systems are further broken down into two basic types, parallel and nonparallel. In parallel systems, also known as nonprogressive, the system is pressurized and the metering valves operate simultaneously. The disadvantage of a parallel system is that it can be difficult to identify a failed (blocked) valve, as grease will continue to be dispensed through the remaining valves. Pump pressure will not increase and there will be no outward sign of a valve failure (Figure 2). In nonparallel systems, also known as progressive, the metering valves are installed in-line. After the system is brought up to pressure, the first valve operates. Grease then flows through it to the next valve in line. In this setup, if one valve fails, the entire system fails resulting in increased pressure at the pump and no grease consumption. No other obvious problems can be used to quickly identify the exact point of failure (Figure 3). Parallel and nonparallel systems can be further broken down into single- and dual-line systems. Today, the most common type of centralized grease system is the indirect single-line system, accounting for more than 50 percent of the market. For single-line machines, injectors represent the key to quality performance. In single-line systems, injectors are responsible for metering the correct amount of grease to the bearing or other surfaces requiring grease lubrication. When advancing to a new cycle, one must always vent the injectors. The other type of system, the dual- or two-line system, uses two supply lines to provide grease to the injectors. A four-way valve is used to direct grease alternately to each of the grease lines while relieving pressure on the other line. The second line provides a safety margin but involves additional cost and complexity related to installation. There are a number of ways to control both the single- and dual-line systems. The valves can be operated manually, cycled by a timer or controlled by a counter that measures grease flow. Various strainers, filters, alarms and monitoring devices may also be included in the system. These systems are set up in one, two or three stages, depending on the number of lubrication points. 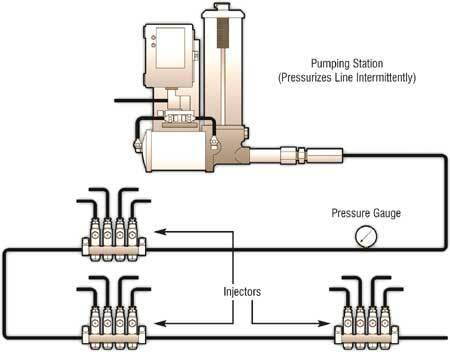 Besides injector valves, all centralized grease lubrication systems incorporate a reservoir of grease, pump, controller, lines and metering blocks as shown in Figure 1 above. Reservoir: Provides a bulk quantity of grease that can be kept clean and readily available to the system. Pump: Produces the flow of grease and builds up pressure in the line(s). Pump size will vary depending on the distance between the pump and the farthest injector. Controller: Manages the pressure on the system by turning pressure supply valves on and off on the basis of either time or cycle. It can also receive signals indicating restricted or failed grease flow to the bearing.